The Campbell Chamber Community Foundation is pleased to announce the formation of its Scholarship Fund to support graduating Seniors from the Campbell Union High School District. The first scholarships, to be offered in 2019, will be presented in the names of two outstanding women who were both icons in the Campbell community – Betty Deal and Sally Howe. Selection criteria, as well as the amounts of the scholarships are still being developed. The intention is to eventually endow both scholarships so that they can be presented in recognition and memory of Betty and Sally in perpetuity. 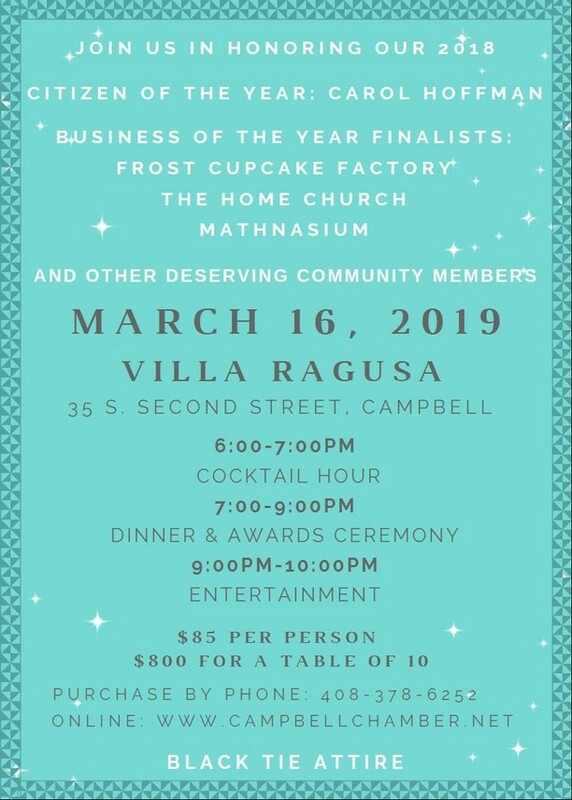 The first fundraising drive for the Scholarship fund will be held at the 51st Annual Celebrate Campbell Gala Fundraiser on Saturday, March 16, 2019, at Villa Ragusa in Downtown Campbell. Anyone wishing to contribute to the Scholarship Fund can make a donation by clicking on this link: Click Here to Make a Donation to the Scholarship Fund. Checks, made payable to the Campbell Chamber Community Foundation, can be mailed to 267 E. Campbell Ave., Suite C, Campbell, CA 95008. For more information, please call 408.378.6252. Betty Deal was a pioneering powerhouse in the Campbell Community who possessed a true zest for life. After leaving her high-tech career in 1994, she became the Executive Director for the Campbell Chamber of Commerce and ran the Chamber for almost two decades. Betty was active on various community boards including the Heritage Theater, the Campbell Historical Museum and Country Women’s Club. Betty had an undying love for NASCAR and Dale Earnhardt Jr. In 2008, Betty was Citizen of the Year, also being recognized by the City of Campbell and the County of Santa Clara Office of Women’s Policy as one of ten Women of Distinction. Betty retired in 2013 but remained an Ambassador and received an honorary lifetime membership. Known throughout Campbell as The Real Deal, Betty loved her country, her community, the Chamber and all of those with whom she made friends along the way. One of Campbell’s trailblazers, Sally Howe was a force to be reckoned with. Feisty, spirited, enthusiastic and always on the go, Sally tirelessly gave of her time and talents, spearheading Carol of Lights for many years as well as volunteering at Chamber festivals. She bred, showed and won multiple awards for her Pembroke Welsh Corgis. Sally was an enthusiastic supporter of the arts, especially music and local theatre. In 1990, Sally was honored as Campbell’s Citizen of the Year and in 2003, she became the owner and editor of the Campbell Express. She had contributed to the newspaper for many years, so it was a natural fit for her to become its proprietor, which she managed until her passing in 2015. Sally was an active member of numerous organizations including the Campbell Chamber of Commerce, Country Woman's Club of Campbell (CWCC), and Golden Gate Pembroke Welsh Corgi Fanciers (GGPWCF).